The curious point about 2013 has been that despite the US recovery gathering some momentum; Chinese and European growth stabilising; and even dormant Japan being given a boost with record stimulus, EMs, the most cyclical asset class of them all, have underperformed badly for the second time in three years (MSCI EM Index returned -23.3% relative to the MSCI World Index and -26.2% relative to the S&P 500 Index, 2013 YTD 31/12/13. 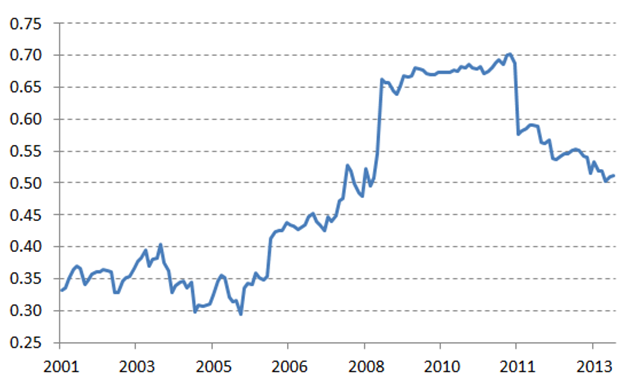 Source: MSCI, S&P.) We attribute this negativity towards the asset class to a number of reasons; and encouragingly, with each of them, we can see some causes for optimism. Even as the world economy has recovered, inflationary expectations have fallen. Investors remain unconvinced by the sustainability of the developing economic recovery, absent of extraordinary stimulus being provided by the world’s central banks. Historically, inflation correlates strongly with money velocity. Unfortunately, declining money velocity (nominal GDP/M2) in all the major economies still points to lower inflation ahead and thus tougher pricing power for EMs. 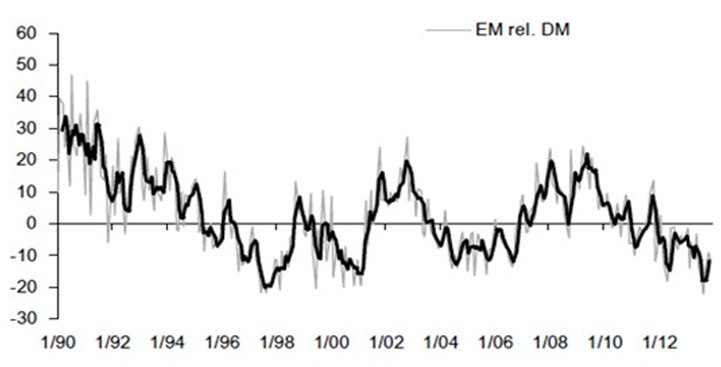 Core EM CPI is at post-global financial crisis lows leading to a very predictable effect on EM earnings revisions. Students of inflation will know that it is a lagging indicator. We are watching credit growth in the developed economies and China very carefully as an indicator of whether we are moving out of a disinflationary era. We are already seeing some evidence from the European banking sector that provisioning, capital raising and write-offs appear to be coming to an end. Acceleration in lending activity could well be a surprise for 2014. Even if this is not the case however, given EM earnings revisions are already at trough levels, some reversal in this pattern is likely. Global trade is commonly cited as the driving force behind EM growth. Interestingly, EM exports to other EMs have dramatically grown in importance and now account for two thirds of their exports. It is perhaps not surprising then that EM stocks have shrugged off the recovery in developed economies. This suggests that the synchronised recovery, although helpful, will not be sufficient alone to boost EM equities. The main economic swing factor for 2014 will relate to the ability of the EM consumer to remain buoyant in light of widening current account deficits, tighter global credit conditions and in some cases, an unclear political backdrop. Undoubtedly this developing risk has already taken its toll on equity risk premiums across the asset class, particular in the “Fragile Five”– the countries with well-publicised deficits; South Africa, Turkey, Indonesia, India and Brazil. However these countries only account for 28% of the MSCI EM index. And even within the Fragile Five we can draw a distinction in terms of the real interest rate adjustments that have already taken place (Brazilian 2-year bonds are currently offering a compelling 5.5% real return). Furthermore it should be noted that the exchange rates in some of these countries have already depreciated a dramatic 30-50% over the last three years. So while conditions might be tough for these countries, we might well be surprised by just how much has already been priced in, and indeed how robustly the wider asset class might perform. For the Fragile Five in 2014, we must not only watch the progression of real rates, but also the flow of funds into EM bond portfolios. More and more corporates have sourced funding directly from the international bond market over the last few years, displacing bank loans. The behaviour of these investors (rather than banks themselves) will determine the availability of credit during a period of tapering in the US. Redemptions from EM bond funds could stabilise if investors differentiate between tapering and tightening. This is crucial, for if the Fed can begin the tapering process, whilst preventing a sharp spike in US bond yields, then the attractiveness of the yields in the Fragile Five will remain too compelling to ignore. Needless to say, no discussion on investment opportunities would be appropriate without considering valuations. It is here that long-term investors can take a great deal of comfort. Valuations are approaching the bottom of an established 25-year range on both P/BV and P/E. So therein lie the risks, and some of the opportunities for 2014. Of course, there are over 1,000 companies across the Emerging World and many of them will be delivering outsized performance despite some of the macro economic challenges discussed above. Indeed, many will continue to benefit from the new wave of consumer activity that is running its course across EMs. (See EM consumption – riding the Second Wave for our thoughts on why this key theme is relevant for investors in a lower growth environment). We will be monitoring developments next year with interest, and look forward to snapping up some bargains in the New Year sales!